Bit Tooth Energy: T7. On Augering, coal reserves and EROI. T7. On Augering, coal reserves and EROI. Today I thought I would digress a little from the more methodical passage through history that I was taking in regard to coal mining to talk a little about coal reserves, coal resources and technology. It is a little focused towards some of the work that we developed some years ago, and so I give you that warning up front. I am going to try and keep it simple, and so those who know about what I write should bear that in mind. When you find a seam of coal, if it is near the surface then the soil and rock can be removed from over the coal, the coal removed, and then the rock and soil are replaced. This is surface mining and I will cover that in a specific post later. At the same time there is a point where the coal is too deep for that process to be economical, and so underground mining takes place. There are two main methods of mining coal, room and pillar mining and longwall mining, and I’ll talk about them in separate posts also. Today however I want to cover that point where the seam has just become too deep to make it profitable to take any more of the cover from the coal. One method of mining at this point has been to send a small mining machine known as an auger in to mine out the coal, that is exposed at the edge of the mine. The auger works in the same way as a wood bit that chews into a piece of wood, when you want to drill a large hole through it. There is a cutting head on the front of the machine that cuts into the coal, and then behind the head is a scroll feed that carries the coal out of the hole, to a point where it can be collected and taken away. Auger cutting head (Cutting head. (Source BryDet Augers Note the head is shown without the picks that would be placed in the sockets on the face of the two perimeters. Typically the auger holes are placed relatively close together, and they are drilled on the order of 100 ft deep. One of the major reasons for the limitation that the auger will drill into the coal is related to the way in which the auger works. In just the same way as when you drill a hole with a wood auger, you have to push hard to get the bit to cut into the coal. But the push has to be transmitted down the flights of the spiral sections of the auger assembly. These are not very strong, and they rub against the walls of the hole that has been drilled, so that as the drill goes further into the coal, more of the push is used up in the rubbing friction between the scrolls and the wall of the hole. Also, if you push too hard after the auger is in the coal some distance then the scroll shafts can slightly buckle and this can thrust the auger head out of alignment so that it drills into either the roof or the floor. The auger is thus a tool with a relatively limited role, though in that role it can be quite effective. Now here is the change that we made. If you take two or three small (0.04 inch diameter) nozzles and attach them to the front of the auger head, so that two cut on the outer edge of the hole, and one is on the inner diameter, then the jets of water that come out of the nozzles will cut into the coal. The jets should operate at around 7 – 10,000 psi, depending on what other rock is found to be in the coal. 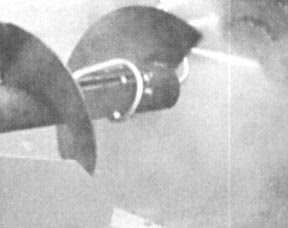 Typically these jets will cut into the coal about 6 – 9 inches ahead of the auger body as the head rotates. This breaks the central core of the coal free from the confinement of the surrounding coal, and when the head contacts the coal, it will break outwards in tension, in handle-able sized pieces. The push now required to move the machine into the coal is much lower (we had a student with one arm in a cast use a come-along to pull a 2-ft diameter machine into the face). Because the coal breaks so easily, and the force is so much lower, the scroll sections do not have to be so large, and without the need for the high thrust a smaller scroll, that does not contact the walls all the way around the hole, can be used. With this combination, since there is now no frictional limitation to the push, and the force required to pull the auger head into the coal is so much lower, the range of the machine can be extended from under a hundred feet, to several hundred feet. The small blocks across the auger face show where the nozzles are mounted. (The sawdust is because we cut plywood to see the cutting pattern). However there is an additional advantage to this change in design, and that comes about because the coal is now being cut with a water stream instead of with a mechanical tool. The pressure and cutting pattern of the stream can be adjusted so that the jet cannot continuously cut into the rock that overlies and underlies the coal. When the cutting pattern is controlled in that way, and with the lowered push being applied to move the auger head forward, the head cannot cut into the rock, but is held to follow the coal seam. The machine becomes inherently self-steering, and thus can drill further into the coal than its predecessor. I have described this machine (which we only tested in the lab before the energy crisis of the 80’s went away) to make a relatively simple point. With very little change in the design of the auger – using existing pumps and other parts, we built a machine that could extend the range of mining from the highwall of the surface mine into coal that would otherwise be uneconomic to mine, for a distance of probably more than half-a-mile. (That is based on other research I’ll talk about another day). The innovation is but one of many that could be made to transition equipment being used today to allow it to mine coal that is only counted today as a resource and which people are quite quick to discount as being un-minable. The economic need for coal is going to be such, however, remembering that all the solar and wind energy being currently used in the country adds up to the power output of only one medium sized coal mine, that we will be mining for a long time. As we do, and the easily recoverable coal goes, then in exactly the same way as innovation has made more difficult gas and oil resources into reserves, so we will see the same change occur with coal resources. And of those we have enough to see us through until new sources of power come along in the right scale and from that they will replace coal. (Please note I have originally used photos and sketches from the internet for this piece, as I get more skilled in modeling I will replace them with my own. I will also more jet pictures later). So did we miss the Peak in Oil Production?